"Baikalcomplex" offers reasonably priced tours and homestay along both the Trans-Sib and BAM railways. There is probably no more beautiful place in all Russia than Lake Baikal, the 'Pearl of Siberia' - crystal clear (and, for the most part, drinkably pure), set round with mountains and lined with little settlements of wood cabins. Creating her favorites, Mother Nature touches them up with particular thorough and vests absolute power in them. Lake Baikal is undoubtedly this kind of an object. Baikal is a whole universe, for more than 30 million years developing its own way, keeping many secrets deep in the dark waters and leaving unforgettable impressions in every heart of the human, ever visited its shores. 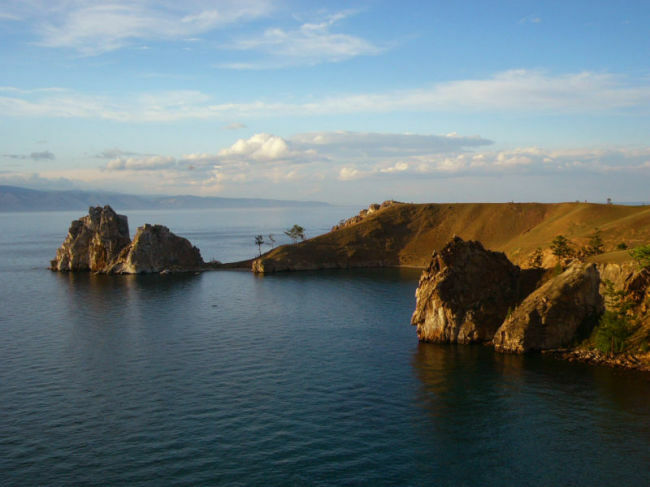 Baikal's coastline stretches for over 1300 miles. Surprisingly, wouldn't it be easier for us to imagine hundreds of thousands miles in the spatial emptiness on the way to the moon than these thirteen hundred miles in majestic and live beauty open for hiking and unhurried views. Nonetheless, one is unable to contain all these pictures within oneself. They are greater more beautiful, more varied and amazing than we are capable of comprehending with our understandings and senses. That can only be believed, unlike the astronomic distances to heavenly bodies. This has to be believed as well as Baikal basin's volume does ( 5520 cubic miles, 20 percent of all freshwater on the earth surface); the depth of its bed-load deposits do ( up to 4-5 miles); the number of its water and coastline dwellers do ( hundreds and hundreds of endemic animals and plants absent anywhere else in the world); and a lot more of other things which are hard to believe. We organize accommodation in hotels and homestays in different settlements at lake Baikal's coast: Listvyanka, Bolshie Koty, Bolshoe Goloustnoe, Khuzir (the Olkhon island), Severobaikalsk. We offer a number of tours to Lake Baikal ( from a day excursion to Listvyanka , visits to Museum of Wooden Architecture and Limnological Museum, up to a week trekking along the shore). Boat trips from 1 hour to 8 days to the north part of the lake. You can also choose one of our jeep, sea-kayaking, bicycling, scuba diving or white water programs. Irkutsk is the most popular stop for the Trans - Siberian travelers. In this city, which was once known as the "Paris of Siberia", you will find people rather more friendly and relaxed than those in Moscow and other Russian major cities on the west. 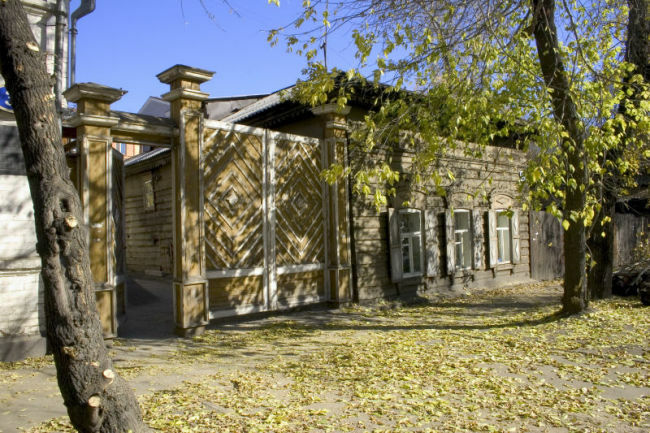 Along many of the streets you can still see the cozy - looking log cabins (eaves and windows decorated with intricate fretwork) which are typical for the Siberian style of domestic architecture. Irkutsk was founded as a military outpost in 1661 by Ivan Pakhabov, Cossack and tax collector who had come to encourage the local Buryat tribesmen to pay their fur tribute. By 1686 a church had been built and a small town established on the bank of Angara. Tea caravans from China passed though Irkutsk, fur traders sold their pelts here, gold was found around and the town quickly developed into a center for trade in Siberia. By the middle of the 19-th century Irkutsk was recognized as Siberia's administrative, financial and cultural capital. Its cosmopolitan population included fur traders, tea merchants, gold prospectors, officials, craftsmen and ex- convicts. Being the capital Irkutsk was the destination of many exiled nobles from West Russia. The most celebrated exiles were the Decembrists, who had attempted a coup in St Peterburg in 1825. Now a days, with the population about 600 000 people, Irkutsk is one of the largest Siberian cities, with more than 10 state universities, scientific town and service & engineering as the main activity. Most of the brick mansions and grand public buildings varying in architectural styles were constructed in the late 19th - early 20th century. Several beautiful Russian Orthodox churches and a Polish Cathedral are located in downtown, near the central square. We offer a variety of accommodations from Deluxe apartments to inexpensive hostels and homestays Russian hospitality. 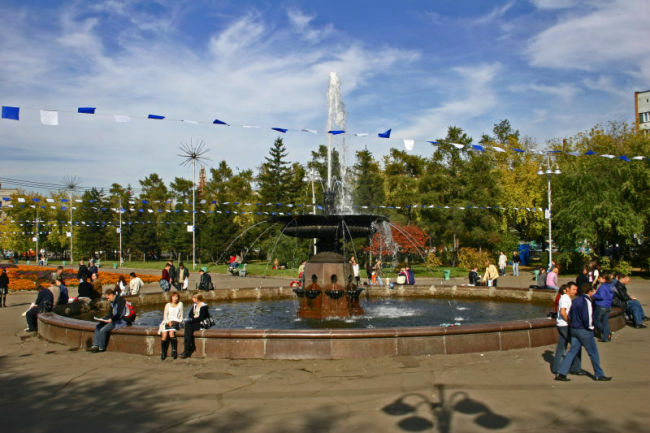 Walking city tour or tour by car, museums and churches of Irkurtsk, cultural and folk programs are to your pleasure. Olkhon is the largest island at Lake Baikal. It is 71 km long and 15-25 km wide. Olkhon is the most beautiful and mysterious place at the lake. The climate and landscape here are different from the rest of the lake. Average temperature in Summer is 20 - 23°C above zero, many sunny days, rains are seldom. In winter there is not much snow, windy, temperature is about -20°C. 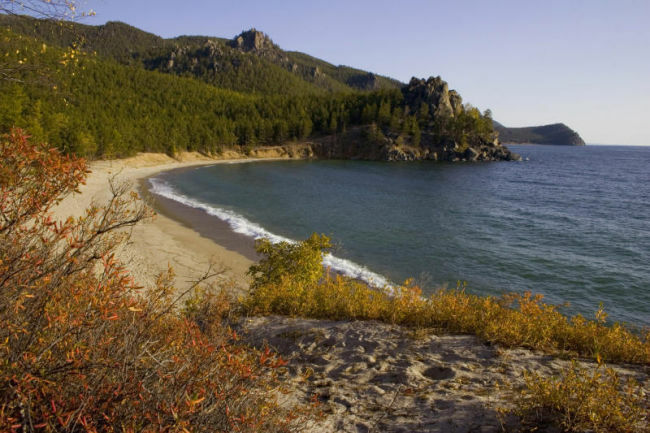 Nature of Olkhon is outstandingly various: there are gorgeous sandy beaches, spacious steppe hills, dramatic capes, pine-tree forests and picturesque rocks, beautifully coloured with yellow, red, orange lichens. The island's dry southern end is rolling grassland - great for off-road mountain bike. This transform in the mid part into thick woodland and at the northern tip there's a fair chance of spotting freshwater seals. The channel between the island and the mainland is called Maloe More, it is one of the few places at Baikal where water in summer is warm enough for swimming. The island had been formed during millions of years of tectonic development. 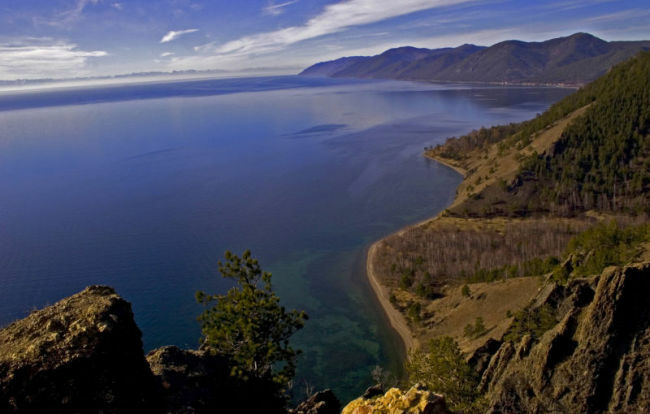 Lake Baikal's deepest point (1637m) is near the Eastern Shore of the Island. On the island there are several small lakes, the highest mountain is the forbidden Zhima Peak, 1300m-high, long time a place for shaman's ceremonies and funerals. 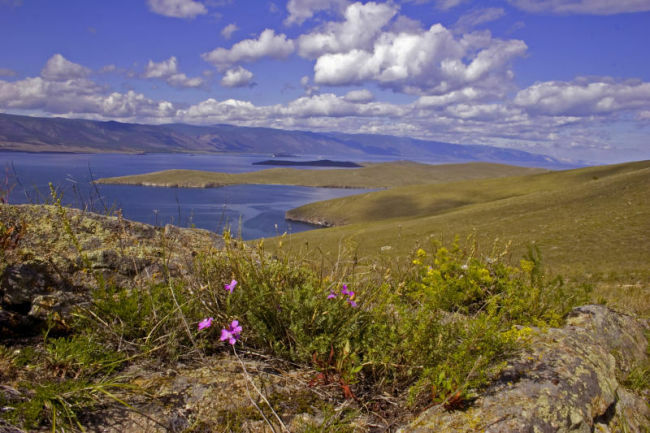 Olkhon Island has several archaeological sites, beginning with the remains of an Iron Age fortress built by mysterious Kurykans, the ancient Chinese people who lived here between 500 and 1000 AD. The Island is famous as the centre of Shamanism, the common religion of the indigenous peoples of Siberia - Buryats. Many of the shamans sacred places and rock paintings are still found here. 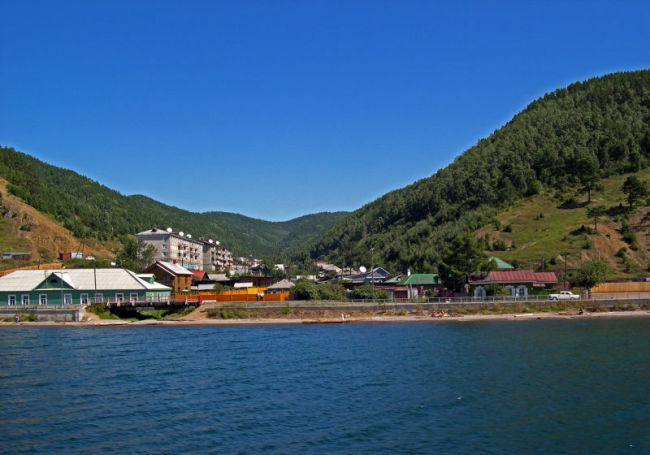 The biggest settlement of Olkhon is the fishing village of Khuzhir with population of about 2.000 people . Ferry operates from mid-May till mid-November from 09:00 am till 8:00 pm. In wintertime (from the end of January till the beginning of April) it is possible to go to the island on the ice from mainland. 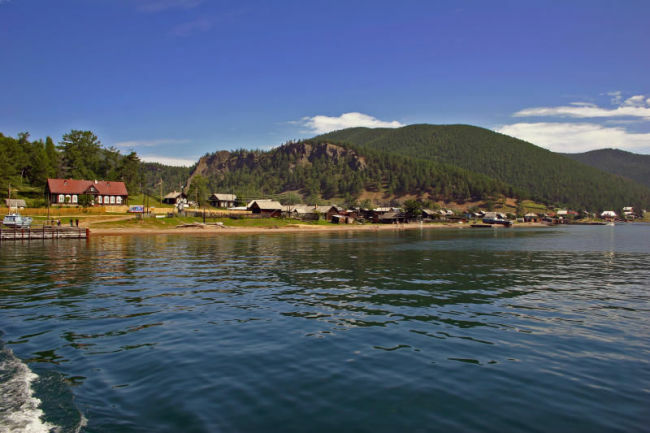 "BAIKALCOMPLEX" arranges variety of cultural and JEEP TOURS to Olkhon with overnight in family pension in Khuzhir or camping in tents at lake's shore. We offer a range of accommodation in Listvyanka, from 3-4* hotels to homestay and hostel. Our travel company owns"LISTVYANKA CHALET", budget friendly comfortable lodge. Build in 2005 out of Siberian pinetree logs, chalet has 13 suit-in rooms.The friendly staff will support you with tourist information and help to organize your activity around Listvyanka. We arrange excursions, hikings, circumbaikal raiway tours, dog sledding, diving in Listvyanka etc. Enjoy our hospitality and you always welcomed ! Bolshie Koty is a small village, located on the lakeside 20 km northeast from a popular tourist destination - Listvyanka. There is no automobile road to this small place, and one can get there only by feet or by boat. The trail is a beautiful 20 km hike along the shore, slightly going up and down. In summer there are regular public boat connection with Irkutsk and Listvyanka, hydrofoils depart daily. Surrounded by woody hills and picturesque cliffs this solitude place has its own life rhythm measured not by hours and days but with the sunshine and seasons. Gold used to be extracted from the Bolshie Koty River and the rusting dredge can still be seen 1 km beyond the village. In the times of the gold rush the village used to have own bakery, power-saw bench, small glass factory etc. Nowadays the main activities for 60 inhabitants of Koty settlement are fishing, work at the Irkutsk University Research Station and growing tourism. In summer the place gets busier with students doing their practical work, locals camping in the nearby valleys and western tourist, came to see the true Baikal background. Easy walks, bright colors, forests full of mushrooms and wild berries together with outstanding lake's beauty will take your heart forever. Crime free and with health microclimate, it is ideal against stress, for getting in shape and rest from the city noise and traffic. The area is rich in natural beauty and history, making it a superb base culture holidays and for action adventures. Poor tourist infrastructure gives you limited possibilites to dine and stay overnight in the village. The section of the Trans - Siberian Railroad on the southern shore of Baikal from Port Baikal to Kultuk is called the Circumbaikal Railway. 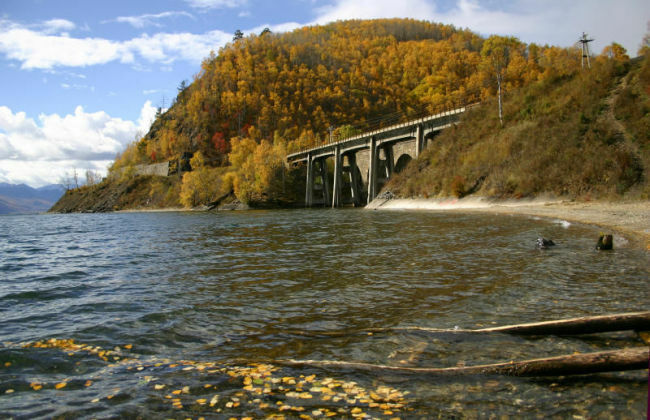 From 1900 to 1904 the raiway tracks from Irkutsk stopped at Port Baikal, across the mouth of the Angara from Listvyanka. From here ice-breaking steam ships carried passengers and trains across the lake, where rails continued. It took 4 years to put the first line around southwestern shore of Baikal and completed the Trans-Siberian. Extension of this line is 84 km, it is the shortest but most difficult section of the whole railroad, it required a tunnel or bridge almost every kilometer. Circumbaikal Railway is a kind of museum of engineering constructions and building art. It is the place where the stonework of tunnels' portals, bearing walls, arches and different picturesque rocks have run into one in a remarkable manner. Railroad includes monuments of architecture, engineering and technical art (tunnels, galleries, bridges, viaducts and bearing walls). 56 tunnels, galleries and other detached buildings, 248 bridges and viaducts, 268 bearing walls, 172 monuments of architecture survive to this day. Together with Russian employees, skilled Italian, Turkish and Chinese contract mason took part in building of bridges and tunnels. 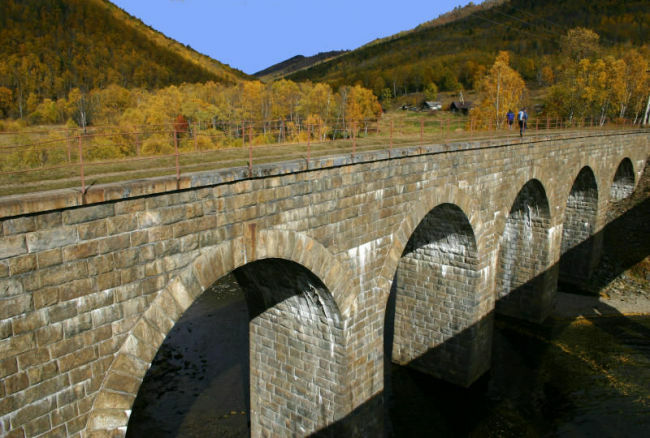 In 1957 the Irkutsk dam was erected and the part of the original railroad from Irkutsk to Port Baikal was flooded. This section was replaced with the shortcut, going strait from the city to south extremity of Baikal. It turned Circumbaikal to a rarely used branch line. Nowadays the railroad is mostly used as a tourist destination for the local people to camp on weekends, as well as for famous tourist trains, such as "Tsaren Gold", "Orient Express" and others. ONE DAY CIRCUMBAIKAL RAIWAY TOUR - the culture explorations for inquisitive, active travelers who appreciate train journeys, historical sites and beautiful nature. One of the most attractive wild areas for all kinds of travelers and adventurers, photographers as well, it was named after a small river that leaves deep and narrow canyon in the ridges for flat plains of the valley. Connected with a good paved way with Sludyanka Trans-Siberian railway station and Federal Highway M55, Tunka is a lot more populated than Oka region. The valley of Tunka is sprinkled with settlements as it is good for agriculture and herding, with rich soils and good pastures. Area is populated with Siberia indigenous Buryat people, the descendants of Mongols, mainly busy in cattle breading and agriculture. 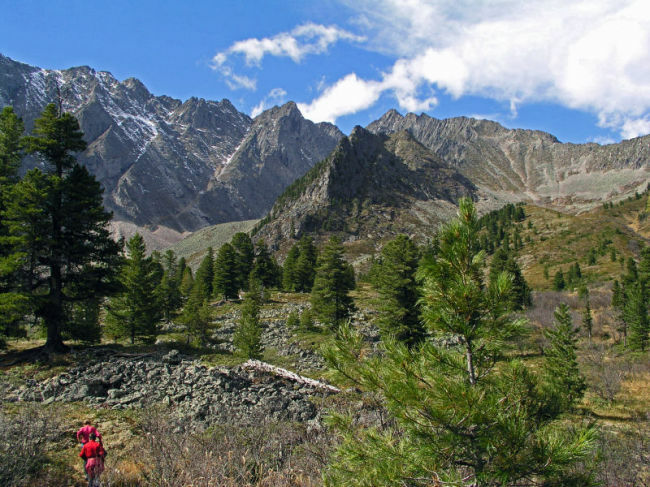 The region is well-known among adventurers first of all because of Tunkinsky Range of Eastern Sayan mountain country. Perfect for backpacking tours, it's also excellent for rafters, kayakers, and particularly for mountaineers and rock climbers. The climate in whole is continental, summers are long and mild, wintertime is characterized by strong frosts starting from November and fading out in February. The whole area bears traces of ancient glaciering, with sharp pyramid summits and deepened cirques, hemmed around with old moraines, the ridges of a sierra type with vertical rock faces and steep cliffs. Glaciers are now replaced by deep and clear lakes with ice cold water. Mountain passes mostly are rocky saddles, with steep slopes lined by long screes with patches of green grass. The absolute altitude of the range is around 3000 m over ocean level. Surrounding taiga (Boreal forest)is abundant with wildlife and different kinds of wild berries, such as raspberry, redberry ( Russian "brusnika", also called as billberry, mountain cranberry), blueberry (Russian "golubika"), huckleberry (Russian "chernika"), bittersweet (honeysuckle) and others. Partly taiga consists of Siberian stone pine which is called "cedar" by locals. The nuts of this tree previously served a perfect raw material for cedar oil, that was replaced by sunflower oil later. The snow melts by June, though in cirques and canyons it can lie all summer through. Northern sides of peaks and passes are covered with deep snow till mid June. Local population uses horses to ride over the ridges through flattened low passes with good horse trails. 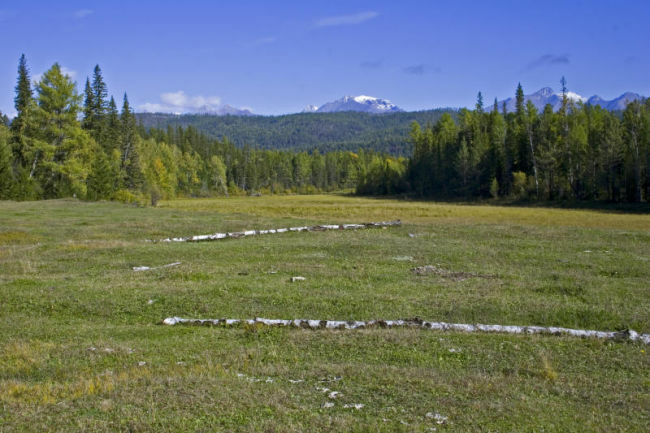 It is also possible to arrange horsebacking trips to the main highlight of the Range Shumak Spring Valley. Along the southern foot of the Range there are a lot of spots with mineral water springs which are utilized by people as a medicine for a number of diseases. The most popular and wellknown are two of them - Arshan and Nilova Pustyn resorts, spa villages with developed infrastructure, good warm curative baths, drinking water springs, hotels and hostels and small cafes along the streets. Since 80-s the whole territory of Tunka region announced a National park. "BAIKALCOMPLEX" offers JEEP TOUR TO TUNKA VALLEY - with visiting Arshan spa, Buddhist temple, a day soft walk up the gorge of Kyngarga river. Overnight in family pension or hotel. Since long before coming the Christianity, the common religion of the indigenous peoples of Siberia has been shamanism, a form of pagan earth-reverence that dates back to the Stone Age. Shamanism take many forms with each tribe and clan having different traditions and practices. However all forms are based on the belief in a universe consisting of the three worlds, connected together. The upper world is inhabited by gods, the middle with the people and animals, and the lower by the spirits of the dead. In the human world, nature is dominated by occult forces from the other two worlds. Man is considered to be an inevitable part of the Nature, but not its "King", respecting, sometimes worshiping other creatures and never wasting nature's gifts. Shamanism, as well as animism, assume the presence of spirits or spiritual qualities in objects of the natural world. Essential is the idea that animals and birds, equally to humans, possess identities and after death their soles travel to the lower world. Philosophically the core of belief is a need of ecological balance. Every natural object, particularly mountains and springs, are believed to have a sole which should be consciously thanked with small offerings. This practice remains most visibly apparent in Tuva, Khakassia, Burytia and Altay with prayer ribbons tied to holy trees and stone cairns beside mountain passes. Spiritual guidance was traditionally offered by shaman: a high priest, prophet and doctor rolled into one. Shamanism is an aggressive discipline involving constant combat with occult forces, demons and evil spirits. The contacts and battles are archived during an ecstatic state induced by dancing, drum beating and occasionally by eating hallucinogenic mushrooms and plants. Although Buddhism and Christianity are now mainly confessed in Burytia, however, there are still many practicing shamans, especially in the western part. 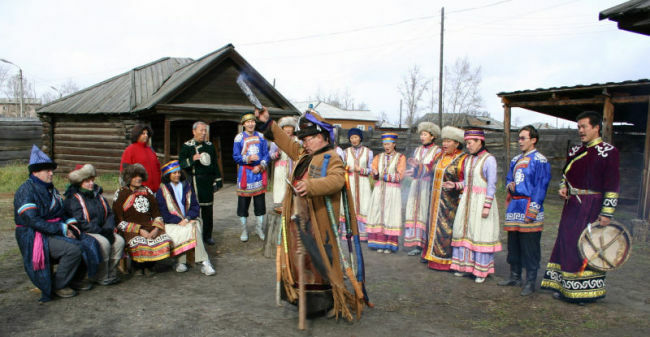 "BAIKALCOMPLEX" offers ONE DAY TOUR TO SHAMANS - the comprehensive trip to Buryat village Ust-Orda, with the folk show, visiting the local lore museum and meeting shaman and taking part in shaman ceremony.